Warning: These eastern arts have invaded the church! can be Christianized. What do you believe? • Would you like to know the true origins of the martial arts? physical -- or could they be something more diabolical? • Isn't it okay for one to learn self-defense? Dr. Rallo answers these and many other questions in this one-of-a-kind book! There are many books on martial arts and books on yoga. 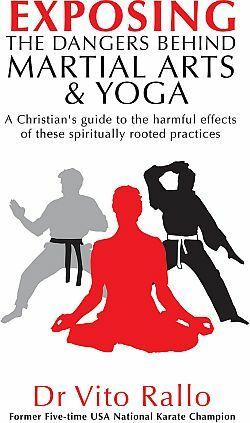 There is also much written about so-called “Christian” martial arts & “Christian” yoga. But so often the dangers behind martial arts are not understood or revealed. How safe is martial arts? How safe is yoga? One must know the true origin and history of martial arts and yoga, in order to understand the dangers. Oftentimes, those who are promoting martial arts and yoga are targeting our children, which is done through movies, video games, and television. The first movie, “The Karate Kid” had a huge influence in promoting children in martial arts. There is now a remake of “The Karate Kid” out today. In the remake, unlike the first karate kid who learned “wax on, wax off,” the new kid learns about channeling and projecting his “chi.” Channeling is an occult practice – practiced by Hindus, Buddhists, New Agers, and witches. There is nothing innocent about it! The truth about martial arts and the truth about yoga is now revealed in this new book, Exposing the Dangers Behind Martial Arts & Yoga. Although yoga is now being highly promoted by educators and the medical field as beneficial, what they don’t tell you is that the side effects are spiritually devastating. Even Hindu and Buddhists priests and gurus will tell you that it is impossible to “Christianize” these eastern arts. What you don’t know, and can’t see, CAN hurt you! The deception of martial arts (and yoga) has snared many—even Christians. But for those who put their trust in Jesus Christ, there is FREEDOM from the devastating and detrimental effects of both! If so, we invite you to follow Dr. Vito Rallo on a journey into the secret world of the martial arts as he reveals the shocking truth! Trained by the best Japanese instructors dispatched to America in the mid '60s, Vito rose to become the "best of the best" in his field! He was a university instructor; he mentored teachers and professional athletes; he coached corporate executives and trained law enforcement personnel. Dr. Rallo is no longer involved in the world of the martial arts. 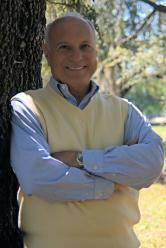 He now shares his life-changing story and personal experiences with groups across America and around the world. Please enter "Speaking Engagement Request" in the Subject Line. Join former five-time National Karate Champion Dr. Vito Rallo on a journey into the secret world of the martial arts as he reveals the shocking truth! A portion of the proceeds from book sales go to "Feed the Children." concerning the dangers behind martial arts and yoga. This book is also available on Amazon Kindle or iTunes (Apple iBooks) for $9.99.